I find it amazing that there's signs telling people to "Keep your feet off the seats" on the London Underground. It's just so rude & inconsiderate to do this on the Tube, no matter how tired you are. I'm pleased to say I have never ever done this. Jag of Route 79 has taken an excellent picture of the woman below sort of realising that she shouldn't have her feet on the seats. He's called it "Considerate feet on seat" in that she decided to put a newspaper down on the seat first before putting her feet up. Probably felt a bit guilty because she's sitting right next to a sign that says "Please keep feet off seats". Technically, though, her feet aren't on the seats. I really don't normally like Nanny State signs and ones that say "You wouldn't do this at home so why do it in public". But this is one of those occasions for me, where it should be, "You would do this at home, but you'd be wearing slippers, socks or in bare feet, and some other poor sap wouldn't then have to sit down where your dirty shoes have been - so don't do this in public". 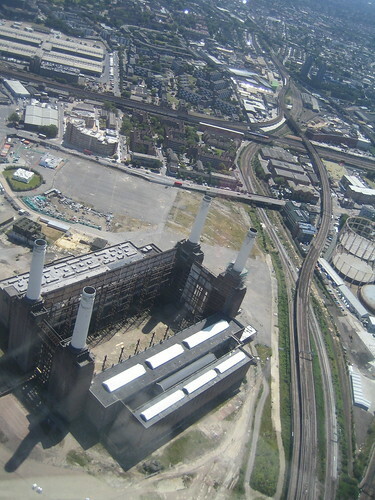 Battersea Power Station's £4 billion re-development could rest on an extension of the London Underground. Well that's according to an announcement the iconic power station's developers made last week. 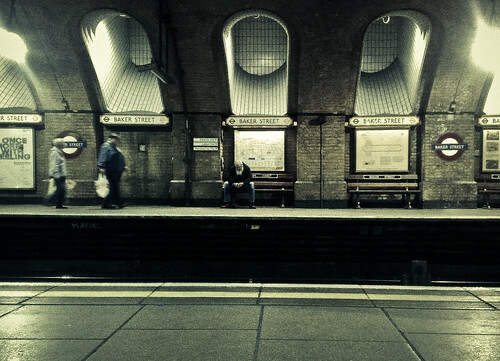 So possible good news for Northern Line commuters for once. The plans include a possible extension of the Northern Line from Kennington via Wandsworth Road. 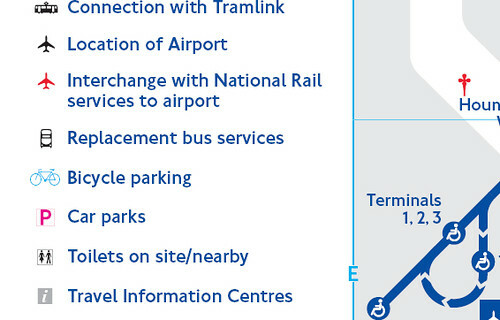 Improvements to transport links are seen by the South West London council where the power station is, to be necessary to support any development in the area. "The best option for real improvement would be an extension of the Northern Line, which we are keen to pursue," said a spokesperson for the site owner - Treasury Holdings. "It is most likely to be entirely privately funded as (Transport for London (TfL)) money has been committed to other projects like Crossrail." "From a planning perspective, they've got to tick certain boxes," said a Wandsworth Council spokesperson. Treasury Holdings has now commissioned Steer Davies Gleave to carry out a feasibility study into the Northern Line extension. This will then feed into an overview of transport in the area being carried out by TfL. For more see New Civil Engineer. From 25th June - 5th July you have the opportunity to explore the site and see the plans. "A walking tour around, and inside, elements of the Power Station building is available for adults and children over ten years old. Bring sensible shoes and your cameras for this opportunity to get up close and personal with the iconic four chimneys!" says the Battersea Power Station's development website The site is open from noon till 8pm up to 3rd July & noon till 6pm 4th July & 10am to 6pm on 5th July. UPDATE here's my post on the Battersea Power Station Walking Tour and I believe that there are two new dates of the 13th & 19th July. Update - November 2010 - Station Upgrade has been approved by Wandsworth Council with two new Tube stations proposed. There's loads of weird and funny things that you can spot in London and on the London Underground, if you have a look for them. As a tourist or even as a commuter, it's easier to take pictures of the "London postcard" scenes - or to zoom past things so quickly you never notice things. 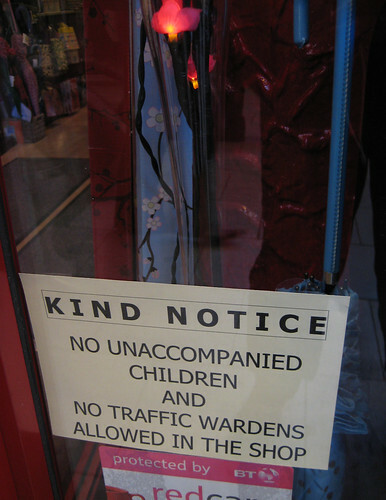 I must have walked past the window of the shop above countless times, but it was only a few days ago that I saw the "Kind Notice", which didn't allow unaccompanied school children or traffic wardens to go into the shop. What the owner has against traffic wardens is only for us to guess. The reason I probably didn't notice that sign (it may have been new) is because it was close to the floor. We notice most things at eye-level but often miss really interesting stuff by not looking up or down. If you like looking out for interesting things and have a camera (or at least a camera phone) you might like And I Saw (part of the Hide & Seek Festival) which carries on today - Sunday 29th June at the Royal Festival Hall. To play the game you'll need to register your phone number and give yourself a tagname. Then all you need to do is bring your phone, yourself, a camera if you like, and most importantly your keen sense of vision. Anything could be part of the game, a balloon, a person wearing a T-shirt, a sticker in a shop window, a fellow player." Also, next Sunday 6th July 2008, the London Transport Museum (supported by Qype) are holding a Flickr Photographic Scavenger Hunt. As part of the London Festival of Architecture 2008, the London Transport Museum supported by Qype providing prizes are getting people to try and capture some of the overlooked design highlights on London's transport network. In a race against time, teams of photographers will have to unlock a series of cryptic clues in order to snap roundels, station murals and much more. Prizes will then go to the first team home on the day (with the most correct answers), and bonus goodies will be awarded for the best pictures uploaded to Flickr. It actually filled up very quickly, as there were only 30 places available, but there's been one drop out, so if you can get to Covent Garden & are free next Sunday afternoon and would like to go, please express your interest here. Yesterday The Guardian reported that (not really surprisingly) plans to install airport-style x-ray machines in every Tube and mainline rail stations across the UK were ruled out. This was because passengers might find the delays caused by this a tad inconvenient and it would lead to "passenger rebellion". A trial at five unspecified locations over the past six months found that airport-style checks would be impractical and antagonise the public. "The transport minister, Tom Harris, said the public would not accept the resulting delays and there would be objections about personal privacy if an extensive screening regime was introduced. "Screening equipment and dogs can be effective in the railway environment," said Harris in a written statement to parliament. "However, given the very large passenger flows and thousands of entry points on the UK rail and underground networks, 100% airport-style screening is currently not feasible." Even back in 2005 after the July bombing attacks it was thought to be impractical then. 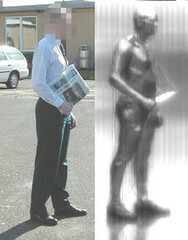 A Transport for London spokesperson told Metro in October 2005 "Body scanners are completely impractical on the London Underground. Heathrow handles 67.1 million passengers each year - London Underground carries 976 million. 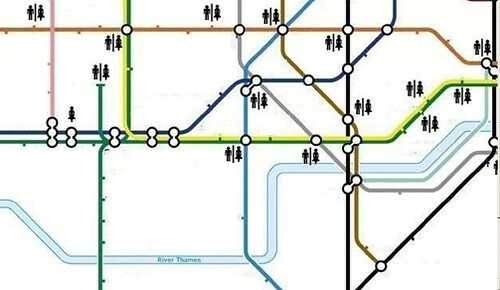 "You can just imagine the delays if such technology was introduced on the Tube. We are constantly reviewing technology to see what could be potentially employed - but body scanners are not an option for us. Our stations just don't have room for them"
This isn't to say that people don't want some form of security. Yesterday Phil Trendall, from the British Transport Police, said: "The public are broadly supportive of the need for security measures." 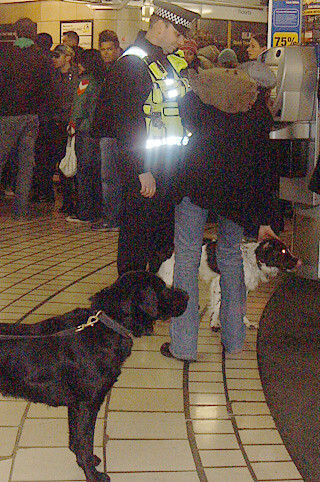 From Thursday you might notice more sniffer dogs and special x-ray machines to screen bags will be used at a "handful" of stations. Thanks to Jon for giving me the heads up to this. I love Rob Ryan's beautiful illustrations and wonderfully intricate laser cut greetings cards and anyone following my twitter stuff would have seen that I went to his shop opening yesterday. Could hardly contain my excitement on seeing this transport related card about calling in sick, taking a train to the sea, eating sandwiches on said train and getting drunk on fresh air. 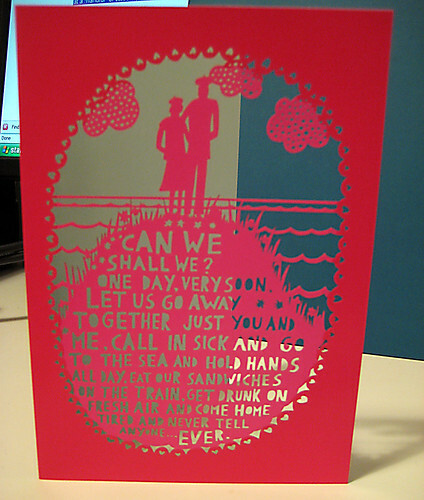 If you can't see the image, which is such a shame if you can't - the card says "Can we, shall we? One day, very soon, Let us go away together just you and me, call in sick and go to the sea and hold hands all day. Eat our sandwiches on the train, get drunk on fresh air and come home tired and never tell anyone.... ever." I also got a signed copy of his latest book "This is for you". His artwork and images are sort of an example of that studied clumsiness that was being spoken about at Interesting08 in that the lettering is beautifully uneven. But the intricacy of the cuts on the card is just amazing. I asked Rob if he would mind his picture being taken. He was somewhat reticent and said if I emailed him, he would send me one. So I will, but in the meantime if you're in the East End, get yourself over to RyanTown, 126 Columbia Road, E2 7RG to check out some amazing stuff. He's recently collaborated with the designer Paul Smith and I can easily see why. You can tell I like him! Update - I've had a lot of personal emails and direct messages on Twitter about Rob's work. People really like it! 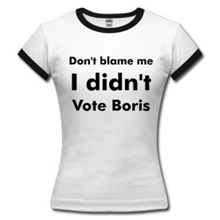 Just to say that his shop only opens to the public from Sunday 29th June - so please don't try to go there till then. Thanks. Going to the London Blogger's Meet Up on the Tube last night I noticed that London Lite had a picture of one of old school cartoon looking fans, I blogged about two weeks ago on their front cover. I find it interesting when the media "discover" a story that a number of bloggers have already been discussing beforehand. 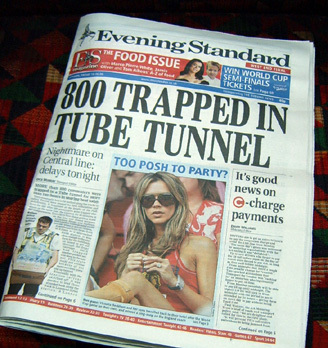 The Tube being hot in the summer time is always going to be front page news. Always has been and unfortunately looks like it always will be. At the end of the banter filled night at the Coach & Horses (summarised by Ged Carroll), some of us caught the tail end of the BBC news also reporting on the fact that the London Underground was hot. They used some footage from 2006 of people getting trapped on sweltering Tube trains and pulled out a TfL talking head to talk about what was being done to air condition the Tube. With the sound down we couldn't hear what the Transport for London guy said, but it was fun to speculate. Now I've been able to watch & listen to what he actually said and it wasn't really that far off what we'd been imagining. Love the "You'd actually be Cooler in Cairo today" quote from the anchorman at the start. The 40 giant industrial fans on the Tube's network are apparently the best TfL can do at the moment (Londonist are also somewhat amused by this). So once again we have to grin (or rather grimace) and bear it. I just love how people will try anything, even the most basic methods to cool down. Hi to all who came to the Meet Up last night including Ged Carroll, Rob Hinchcliffe, The Londoneer, Sandrine, Cedric Chambaz, Lolly, Julius, TikiChris, Londonist Matt, Jaz Cummins, Peter Marshall, Darika, James Whatley, Sian and Tom (Flashboy) and big thanks to Andy Bargery for arranging it. However it led to a lot of questions. Why did they blank out the station name from the poster? It's clearly Baker Street on the Hammersmith & City Line. Baker Street on that line has one of the most recognisable platforms on the London Underground. Did Baker Street Tube station say "you can't use our name"? Or did the agency think "Mmmm we need to make this look like 'every station' so let's blank out the name"? In which case why not use a more non descript station platform that's not so easy to recognise? I also discovered some really weird allergies from the poster & wondered how did people find out they were allergic to certain things. Newspapers for example. Reading some newspapers certainly makes my skin crawl sometimes, but I'd hate to be allergic to them. You must never be able to go into certain shops if you're allergic to newspapers & have a permanent fear of those guys handing out the free sheets. So what happens when you're allergic to newspapers? Thoughts on any of the above most welcome. Plus if you want to share your allergies with us - it might only be - the apparently rather basic now - hayfever. Or perhaps you have something more exotic like an allergic reaction to the smell of sweat, crisp packets or moquette upholstery which would make Tube travel pretty difficult for you. 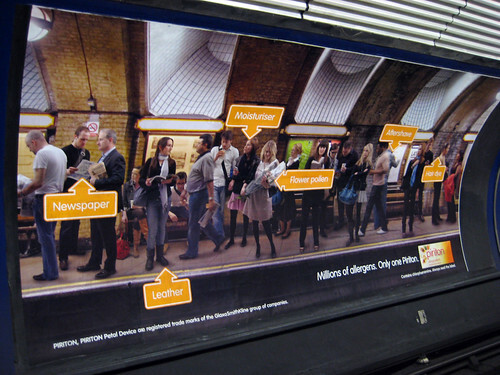 UPDATE - the plot thickens there's another version of the allergy Tube ad with Baker Street. I was one of the extremely lucky people to get a ticket to see Interesting 08 yesterday. 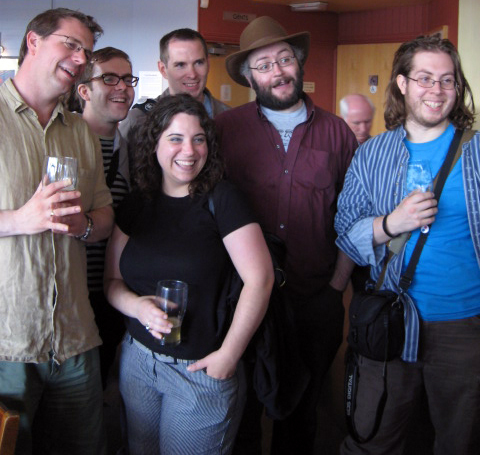 A collection of funny, fascinating, funky & often frankly foolish people who Russell Davies collected together to talk about interesting things. There is tons to talk about and if I were more of a creative generalist I would have a field day in this blog. But in the interests of sticking to my specialism (ish), here's some things that may interest people who are interested in the London Underground, transport & trains. Don't pay for your Tube ticket or basically anything over 20p in 2p's or 1p's because it's not legal tender. 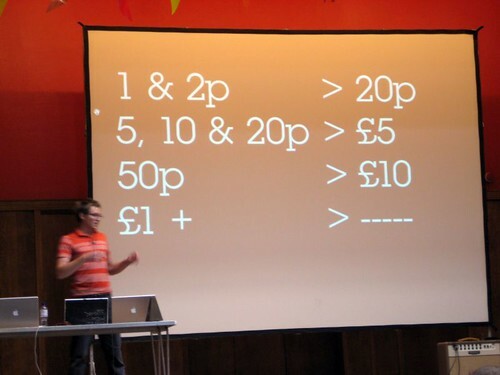 I learn this from Matt Dent, who should know about these things as he won a competition to design the UK's new coins. This legal tender point was a massive jaw dropper for me as I'm sure I've paid for loads of things over 20p with 2p's but technically the person you're buying from can refuse to take them. 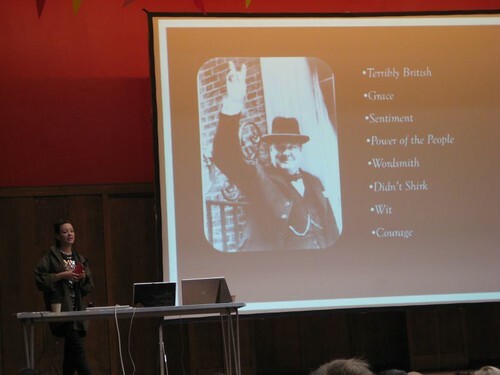 Jenny Owen had lots of brilliant stories about Winston Churchill including this. Churchill was on a train that got derailed which meant he was going to be late for some important war meeting. He had words with the driver, demanding that he get it back on the tracks. The driver ummed and arred for quite a while saying it wasn't that easy to just do it so quickly etc etc. Anyway, Churchill said you will be helping the war effort if you do and I'll remember you. Driver probably thought "Yeah right" and managed to get it back on the tracks. Churchill did remember him with some special medal for civilian heroics - the Alba(?) medal. 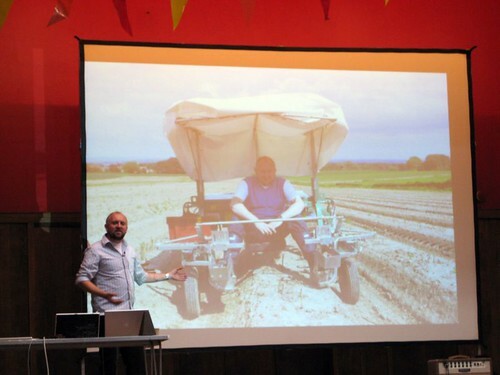 Andrew Webb from Channel 4's Big Food Map driving an Asparagus Picker. It'd never make it onto Top Gear as a fast means of transport, but I love the wacky look of it. Finally, just discovered that Mr Last FM who was directing 30 recorder players pictured above was involved in the Deptford Project Cafe - transforming an old railway carriage into a cafe, which I blogged about last weekend. 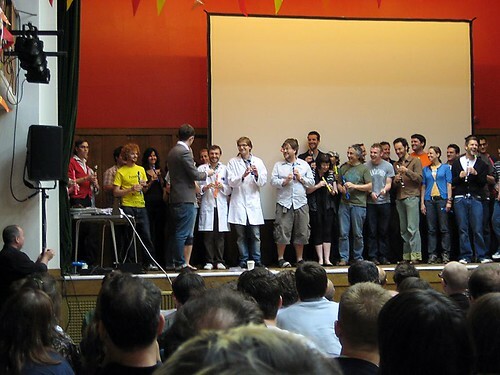 If you'd like to see the rest of my photos from Interesting 08 - including stuff on toilets, magic mirrors, doodling, studied clumsiness, World of Warcraft, LOL cats, Henry the Hoover, beating insomnia & more they're here. 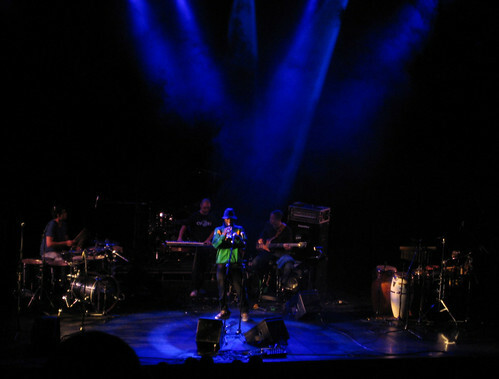 Just back from a fab evening seeing Terry Callier as part of the Massive Attack Meltdown last night. Mondoagogo (Anna) is the only woman in the picture. She joined us for a drink outside The Royal Festival Hall and we were chatting about the gig and other stuff. 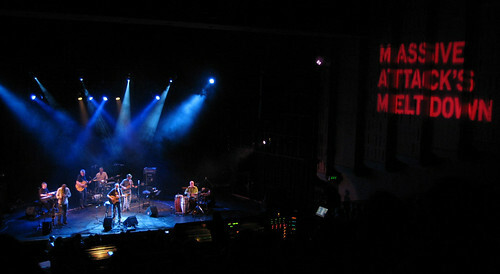 I looked up and saw someone familiar coming out of the Royal Festival Hall. 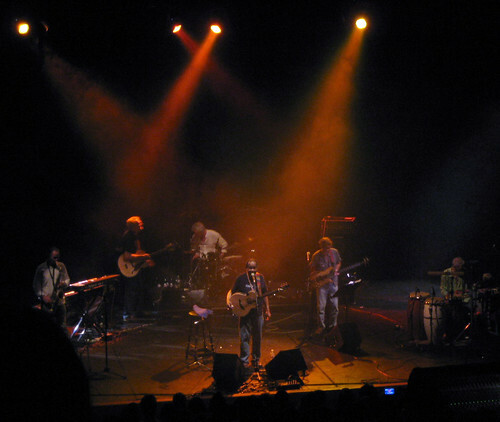 It was regular commenter and contributor, Pete aka the Londoneer, who'd just been to see the Tom Tom Club and Gang of Four at the Festival Hall. So he stayed for a bit of a chat as well. With all the millions of people in London, it still always freaks me out about how you can bump into people you know like that. 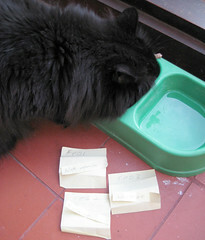 With Bolli the cat's help the prize draw for Nom Nom Nom the interactive version of MasterChef or bloggers' cook-off, has just been completed. 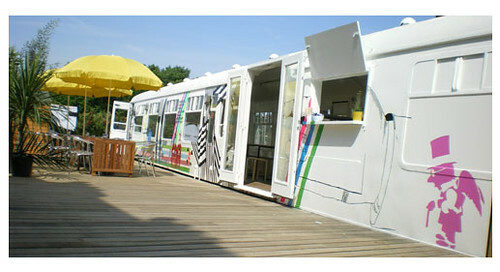 One of the prizes was lunch at "possibly the coolest office in London" - the London Underground Tube Carriages in the sky. My friend James Grieve runs Nabokov, an innovative theatre company who have their offices in these old Jubilee Line Carriages - the Tube offices in the sky on Great Eastern Street, London. Since first blogging about them, they've appeared on Kottke.org, coudal, scottberkun and lots of other cool blogs from around the world. A lot of you also wanted me to try to arrange a visit to go up to their offices. 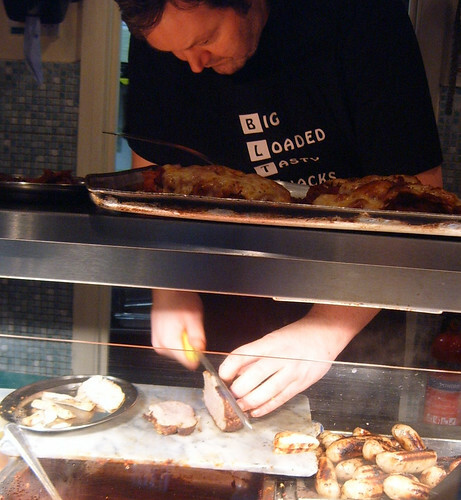 Well I had a chat to James via text (when he was touring in New York) and he kindly offered to take two of you (and possibly me) to pick up lunch at the brill BLT (Big Loaded & Tasty) sandwich shop & then have the lunch back in his Tube offices. So lots of you made donations to Action Against Hunger and you managed to raise just over £660 for the charity - which is absolutely brill. There's still some Berocca goody bags up for grabs, so if bid on something and didn't win a prize and fancy one or desperately want something from the list that didn't get won - let me know. Must stress this is only if you made a donation. The team from Justgiving have your email details and will be getting in touch with you to arrange delivery of your prizes. 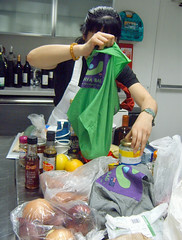 Thanks so much for donating and raising almost seven hundred quid for Action Against Hunger. As regular readers of this blog know, I'm a little bit green. 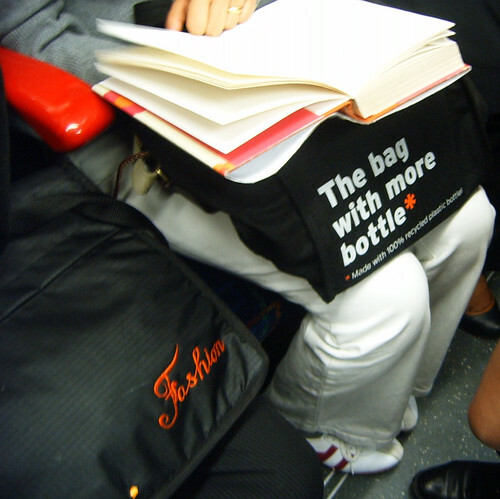 I've noticed more and more people on the London Underground not carrying plastic bags. Some more obviously than others. I was pleasantly surprised to discover that The Guardian's Dave Hill, said I was "saving the world on a Bank Holiday Monday" with my post about GeeKyoto & whether travelling by Tube is green. GeeKyoto is still possibly the best event I've been to this year. 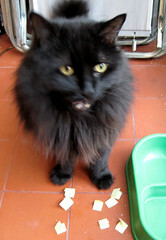 But I'm not a card carrying recycling old hippie wearing hemp shoes and I don't recycle any waste food - which is bad I know - but I don't have space for a compost heap and also don't like those little smelly green bins that sit by your sink. I live in Kew, it's one of those nice pseudo-villages (phrase nicked from TimeOut London's blogger Peter Watts' piece on the No 33 bus) and the Kew Society recently launched a campaign to make Kew Plastic Bag Free. Basically they got agreement from most traders in Kew (with one notable exception) to go plastic-bag-free. 50 local traders including the Royal Botanical Gardens at Kew agreed from July 1st to never hand out free plastic bags and offer their own greener alternatives instead. Read more at Greener Kew. There's a launch party around Kew Gardens Tube Station, Station Parade at 7pm on Monday, June 30. Yesterday's Evening Standard did a piece on this and once again didn't let the facts damage a good story. They claimed that Tesco (the notable exception) had made a "major turnaround" & "retreated". This is somewhat over enthusiastic reporting, as Tesco never said they wouldn't ever give out plastic bags. They would only give them out to people who ask for them, and they certainly didn't positively choose to offer an alternative. 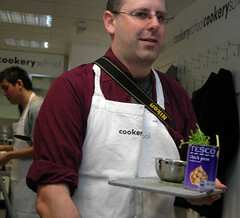 I personally have nothing major against Tesco - although I know many who people have. I use bags for life and Onya bags as much as I can, but not all the time, as sometimes I go out without them. What is most galling is that I know several friends & neighbours from Kew who tried to comment on the Evening Standard's website to say that Tesco shouldn't be seen as the big hero in all of this. At time of writing, none of their comments appear. I wonder why that is? 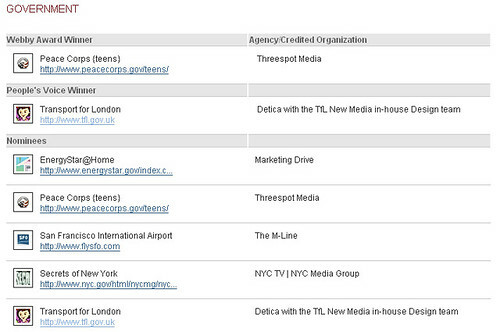 Looks like more London projects are following the lead of the Tube Carriage Offices in the sky. 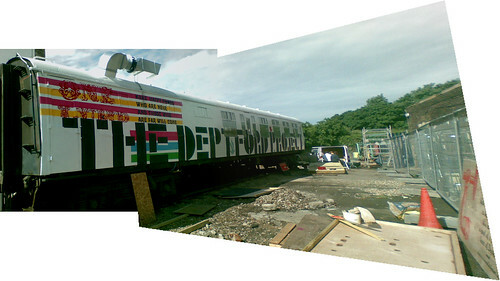 In Deptford, South East London, rather than converting old Jubilee Line London Underground carriages they've taken an old mainline railway carriage and converted it into a cool cafe - The Deptford Project Cafe. "Putting the reputation of the railroads back on track (no delays, friendly staff, plenty of room for everyone), this new converted 1960s commuter train carriage sits stationary in the old railway yard of Deptford Station. It's got a great summery bright design by Studio Myerscough who were also responsible for the handpainted exterior and bespoke furniture (with Luke Morgan). Again like the Village Underground Project in East London it hopes to become a home for creative types. 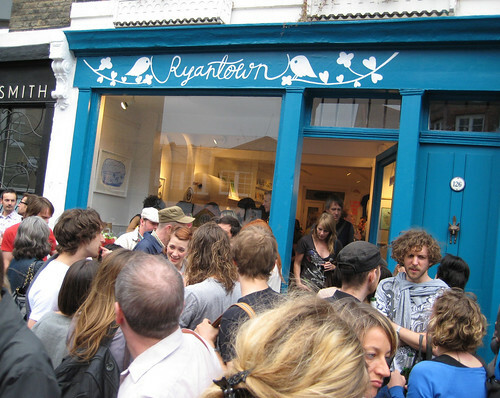 The railway yard will act as a centre for artists, performers, musicians and designers to exhibit their work or put on gigs. I'm due to see Ralf Little's new film The Waiting Room really soon. Very much looking forward to it as it's the first film I've seen him in (he's normally mainly in TV like The Royle Family or online stuff like Kate Modern). It also involves trains and apparently you get to see him naked. Or rather as the Channel 4 review so nicely says "you do get to see Ralf Little's knob (as he's taking a leak, actually), but sideways on." Ralf plays a care assistant/nurse who follows one of his elderly charges (played by Frank Finlay) down to a South London train station where he meets Anna (Anne-Marie Duff) in the waiting room. There the two of them listen to the old man rattle on about love, and share a "James Blunt - You're Beautiful" moment. They don't swap numbers, or even names, but are both hooked from that moment on. An obsessedwithfilm interviewer asks Ralf: "Have you ever had a life-changing moment in a waiting room .... or even on any bit of public transport?" Ralf replies "Not on public transport but I've had 'the moment' of going 'wow, that is the girl I'm going to marry'. Didn't work out! (Laughs) But I've definitely felt it, I'm sure, and I'm sure I'll feel it again ... But talk to me again when I'm single and childless!" "there were scenes with people getting on and off trains and normally in big budget films they hire a train and so on, but we couldn't do that on our budget. So you had this incredible thing where there's this whole film crew on a platform all ready with the actors poised, guessing where the doors might stop, then as the train comes in then the doors open and 'ACTION' and you'd have to leap on the train, pause for a moment, then walk off casually. Brilliant.."
So if you're a South Londoner, or like me, sometimes travel on trains into Waterloo, you'll see many familiar locations in the film. The train travelling past Battersea Power station being the most familiar. 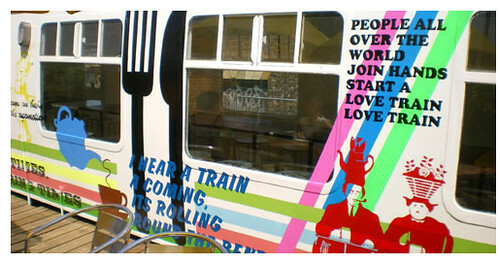 Like it or not, London Underground Trains are often seen as canvases for "urban art", "street art" or graffiti. People like Banksy have certainly popularised the idea that urban art is not only that (ie artistic) but that it's also worth a shedload of money. Many people thought that the Tube Carriage offices in the sky were just an art installation and not real offices. Yesterday I was at an exhibition of Street Art at the Tate Modern which was combined with a photo walk where you could explore nearby streets in Southwark. It was a real eye opener and you can see some pictures I took in the link above (Flickr kindly laid on some food & drinks for us after the walk - photos here). 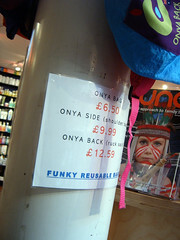 On the way back I popped into the Southbank Centre shop which has lots of trendy and unusual gifts in it. 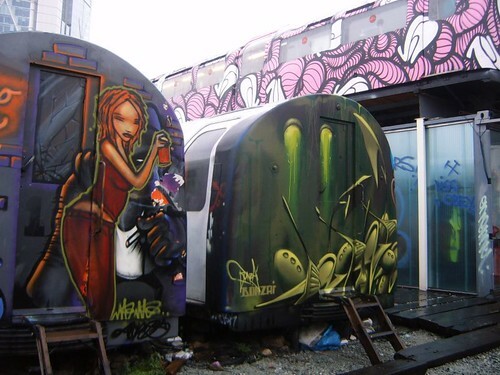 One of them was a "Graffiti Train". 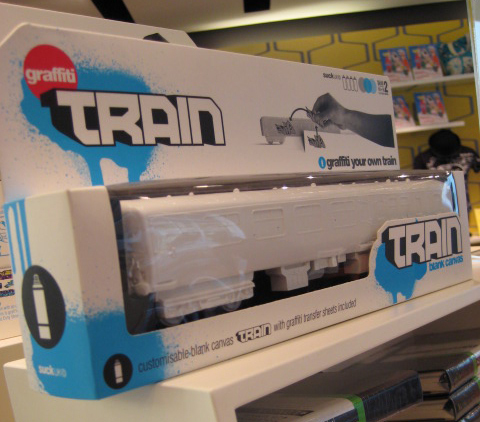 You can see from the picture above that it's sold as a "blank canvas" with transfers and paint so you can "graffiti your own train". 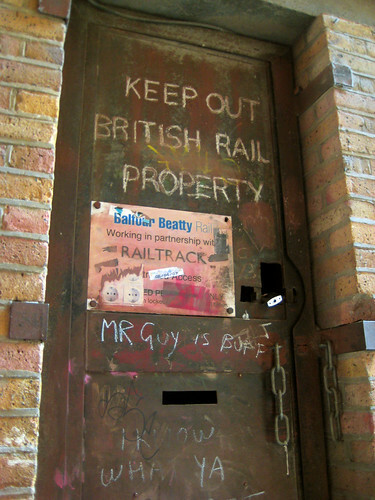 So if you've ever felt the urge to do some legal graffiti or become the next Banksy, Bob's your Uncle. I'd love to know who Mr Guy is and why he's buff. The broken chain on the door also seemed kind of appropriate for "Clink Street". I'm assuming the door's not in use any more and have no idea where it originally led to. Final reminder for your last chance to win lunch in the Tube Office Carriages & get a close up view of the graffiti and see in inside the offices - the prize draw closes tomorrow. What did Transport for London say? As you may remember Transport for London's website won a Webby Award (the internet's equivalent of the Oscars) last month. Unlike the Oscars the Webby's limit winner's acceptance speeches to just five words. What do you think TfL said? Well it's not too hard to find out what they said. "A to B made easy." But what should they have really said? 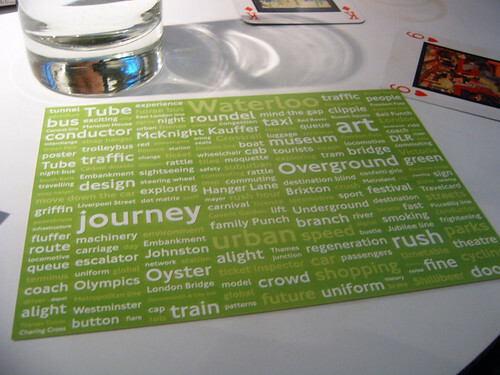 What five words sum up TfL's site or TfL in general? Should they have been honest with "Must hide Bank Station mess"? Funny with "You'll enjoy a smoother ride"? Cyptic with "Never late, latest lates later". Let's have your suggestions in the comments below. Thanks to Jon Justice for letting me know that Tokyo have just got a brand new subway line. The Fukutoshin Line will be Tokyo's 13th subway line and has a grand opening on Saturday. Japanprobe said that to commemorate the opening of the new line, there's an art exhibition being held at the a large department store that featuring a huge mosaic made from used train tickets. The video's below and Jon says to look out for "a brief glimpse of a metro map made out of candy and uh, diamonds(!)." I now think I know where some of the wackyness & weirdness of Japan comes from - drinking Saki. On Wednesday night me & fellow foodies Mex, Chris & Hazel from Londonist (& www.nom-nom-nom.co.uk participants), Niamh, Tim, Lea & Dave were lucky enough to be invited to a Qype night at Tsuru restaurant with Akashi-Tai Sake Brewery. We ate lots of lovely, lovely sushi, but also drank lots of lovely lovely saki. 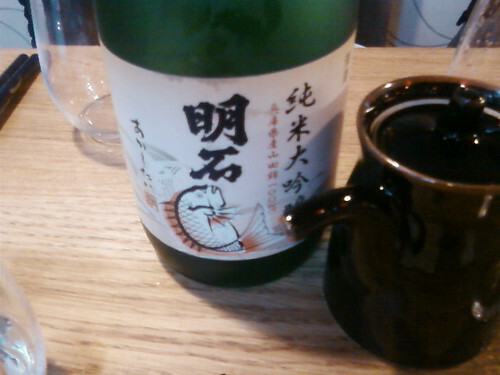 Now the fact that I just said "lovely lovely saki" is very unusual as usually I'm not wild about the stuff. I've only ever drunk it warm and on Wednesday night thanks to the staff at Tsuru I learnt loads about sake / saki (possibly not how to spell it), but mainly that the really, really good stuff should be drunk cold, is smooth as silk and hugely alcoholic. The drunkeness hit us like a sledgehammer wrapped in cloth. After about three very small glasses, you think - "Hello I've only drunk three glasses and this stuff hardly tastes alcoholic - so why do I feel like dancing on the ceiling". Trouble is the alcoholic content ranged from 14% to 19%. Tim said "Although it got increasingly difficult to keep track of everything we tasted as the evening went on, our hosts did a good job of pairing different drinks with different foods. All of it was tasty." But I truly know why when you've drunk that stuff, ideas like "let's make a massive set of mosaics out of Tube tickets and then let's have a cat as a station manager and then let's get Ikea to kit out our carriages with furniture" seem to just come out of nowhere. Unusual sign spotted by regular commenter & contributor Jon Justice yesterday. 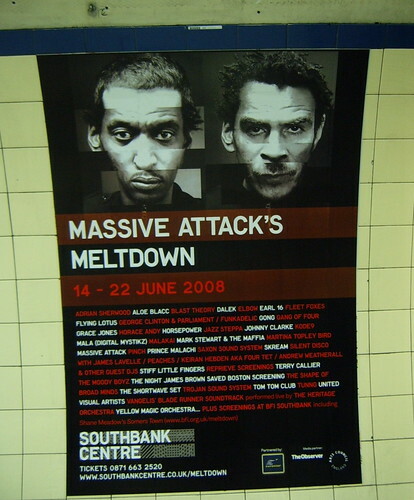 Jon said: "This was at Bank station in the stairs between the northbound and southbound Northern line platforms. I've never noticed these before. Seconds later I found myself needing to go to the bathroom, but I waited until I got home". The power of suggestion eh? I do wonder how the police would deal with those caught urinating though. Does "deal with" mean arrest? Do you just get cautioned? Or do they hand you some loo paper and point you in the direction of the nearest loos. 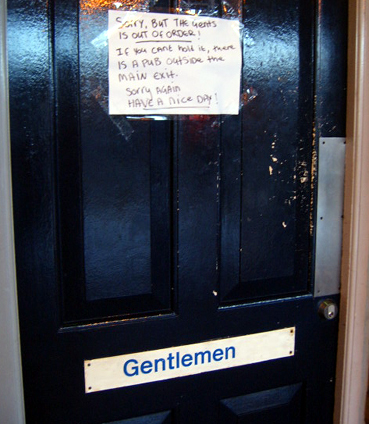 Although that is a bit of a problem on the London Underground, as there aren't toilets at every station. Even if you find them, they're certainly not open the whole time that the Tube system is open. I'm still surprised that TfL haven't introduced a map which clearly shows where toilets are - rather than just in the little key at the bottom of the online map and the pocket maps. 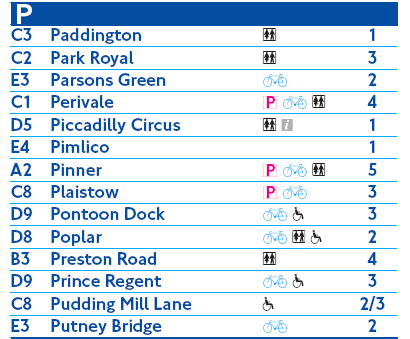 There's a map which shows where you can and can't carry bicycles on board the trains. But I would have thought that far many more people would be interested in quickly knowing which stations had toilets. LastRounds.co.uk has done their best and say "Knowing the location of your closest public toilet can be a handy way to avoid those awkward moments, especially when you're out and about and there's nowhere else to go. Find your local public convenience by choosing a borough on the map here." Any thoughts on what to do when you're caught short on the Tube would be much appreciated. It's hard to think, that it's the 21st century when you see huge "cartoon looking" fans like this as a way of cooling down the Tube. 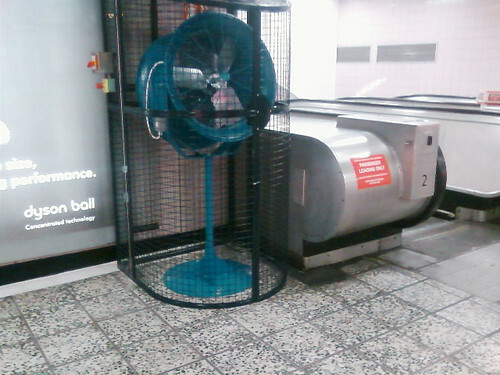 I know we have our problems with air conditioning in the actual Tube tunnels and on trains themselves, but I'd have hoped that station concourses may have been better equipped to deal with the heat than having a large caged fan. But I'm by no means an expert on this and hopefully someone will be able to tell me whether or not this is a funny as it looks. 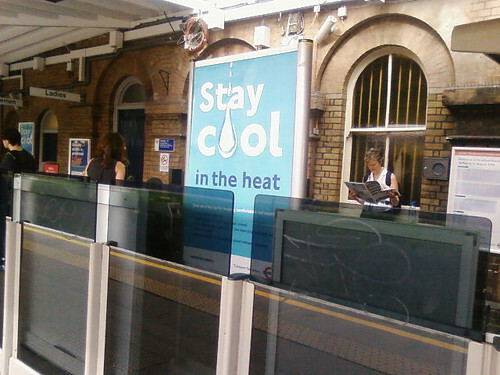 They have helpful advice like always carrying a bottle of water with you, and not getting on the Tube if you don't feel very well and to basically stop acting like you expect the London Underground to have better (sorry strike that) any air conditioning at all. Andrea Riding of Thames Water said "We think the machines would be a welcome addition to every rail and bus station". With a nicely watery reference she continued: "I think we have seen a real sea change in the attitude of Londoners to bottled water and now we hope we can bring that choice to people on the move as well." Apparently the machines will dispense water for free or with a nominal fee of 20p per half litre. However, a Transport for London spokeswoman said of the chance of opening this up to include the Tube: "Although we investigated the possibility, such a system would require the installation of new water, power and drainage system at considerable cost, and would create passenger flow problems." But if they can cope with that cost at bus and railway stations and the flow at some railway stations is fairly high - why not do it for the London Underground? Update - the BBC & other London media are discussing the old fans & Tube air conditioning now. I've been visiting a lot of blogs I haven't visited for some time and am always pleased to visit Jack's (BFKA Green Fairy) She's also coming along the the Flickr Scavenger Hunt at the London Tranpsort Museum in July (there's still some places left). One of my favourite posts of hers is when she blogged about a Tube station announcer who wanted a cleaner as there was spinach on the concourse. She pictured "Spinach in the tube station! A small forest of swaying vegetation smothering the Oyster machine in dark glossy leaves and a hazy cloud of vitamin C! Rows of crisp, fresh lettuce springing up between cracks in the pavement! Runner beans snaking fat tendrils through the tunnels and a sudden shower of plump, succulent sprouts being gamely mopped up by the ticket inspector! Feathery carrot tops shyly nudging their way through asphalt! Rivulets of pea running freely in the gutters! Scores of workers throwing off the shackles of the tedious daily commute, donning wellies, shovels and wide, carefree grins and digging happily for..."
To have her terrifying image ruined when her friend said "spillage". Anything else that you think the announcers are saying on the Tube? 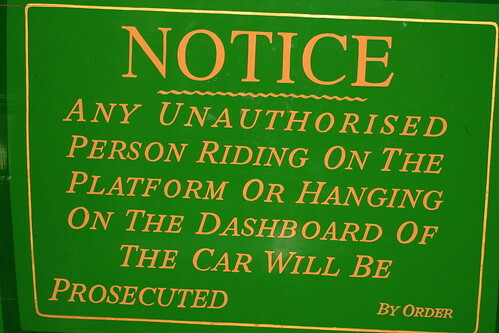 Speaking of spillages do you think they should have said "Would Inspector Bucket please report to platform 6" or do you know of any other code names for emergencies like "Inspector Sands please come to platform 5"? 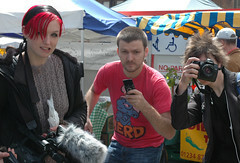 Wow, at last, the moment of reckoning arrived yesterday we announced the winners of the Food 2.0 Nom Nom Nom event. First of all it was a really great project to work with Mecca & Walid on. I simply couldn't believe how dedicated everyone involved was. The judges rocked by giving us their time, expertise, and good humor. 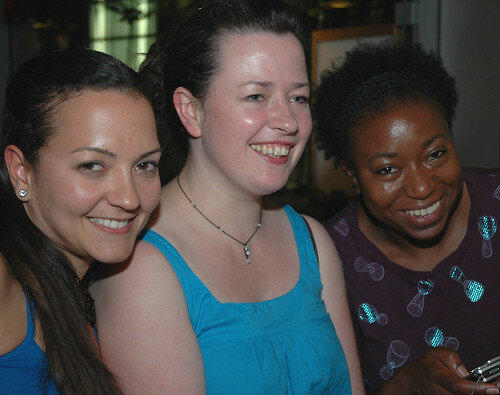 We couldn't have wished for better participants, who were so great from start to finish. 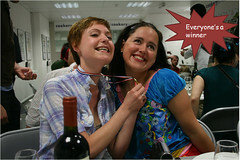 We had a really challenging time determining who had won, as the event covered three areas. So we looked at the points the judges attributed to the taste of the food, the votes for the best photography and video, and most importantly with the lion's share of the votes, those made by you - so thanks if you voted online. Thanks to SpinVox for sponsoring the event, but extra special super duper thanks to Ros and all the staff at the amazing Cookery School (we could not have done this without you). Thanks to all the other sponsors for their support, and once again thanks to everyone who took event. Re one of the pictures above I ran a little competition on Nom Nom Nom to see if people could guess which of three pictures had had the most views - you're welcome to try it out. You can leave answers in the comments on here if you like. Finally, the charity prize draw is open until the 16th June and there are still some prizes with no bids on them - so get over and see what you could win & help Action Against Hunger at the same time.